Beautiful, lakeside Lucerne is a romantic, historic city with an almost mythical feel to it. The views over the dark lake to the alps, the wonderfully preserved medieval old town, the graceful waterfront promenades, pretty bridges and this city’s penchant for emotive music all combine to make it a magical place to stay. People have been raving about visiting since Mark Twain, Queen Victoria, Goethe and Wagner spread the word of its charms in the 19th century. Unsurprisingly you’ll find some of the best places to stay in Lucerne, for those with a romantic trip in mind, on the shores of the lake or overlooking the city. The two places you must visit for a stroll are Lucerne’s Lido and the Swiss Transport Museum, which are definitely both worth a visit - especially if you’re visiting in the warmer months. The Kapellbrücke or Chapel Bridge is a 14th century wooden covered pedestrian bridge spanning the Reuss River in a sort of long, historic dogleg. The beautiful emotive Lion Monument is a ten metre long sculpture carved into the rock which commemorates the Swiss soldiers who died defending King Louis during the French Revolution. The Kunst and Kongresshaus Luzern (KKL), an amazing collection of concert halls and an art museum. Lucerne also has the remains of some impressive city ramparts, which you can still patrol, from tower to tower. A museum to Richard Wagner, occupying his former home, a history museum and Switzerland’s largest Planetarium. If you enjoyed the Kapellbrücke you should also tread the boards of the smaller, but all original Spreuerbrücke (the original Kapellbrücke burned down in 1993). One of the reasons Lucerne’s tourist trade was born so early is that it’s in a great central Swiss location, and it’s well connected by the Swiss Railway. As well as travelling easily to Bern, Zürich, Engelberg and Interlaken, you’re also close to the alps and the snowy paradises of Mount Titlis and Mount Pilatus. The city is a popular destination year round. So if you want to secure one of the best places to stay in Lucerne, don't leave it till the last minute to book. 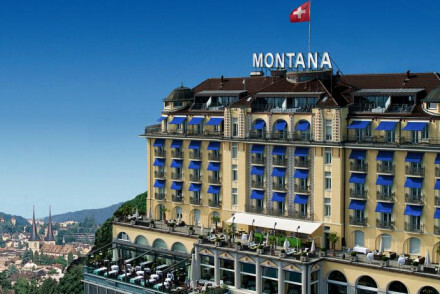 The Art Deco Hotel Montana offers wonderful views of the city and the lake beyond, from its position on a city centre hilltop. It also offers 66 chic, comfortable rooms, decorated in the promised Art Deco style - and some with balconies, and an award winning restaurant and popular bar. 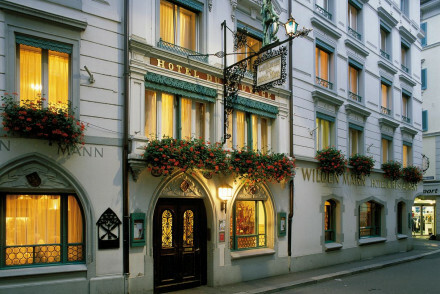 The Hotel Schweizerhof is perfect for a luxurious city break. Right on the lake-side it's just a short stroll from the centre of town. All rooms are individually decorated, there are two restaurants to choose from and a lovely spa. 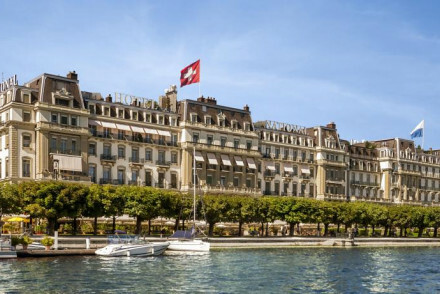 The Grand Hotel National is a wonderfully glamorous institution overlooking the lake. There are 41 opulent rooms, decorated to the nines with antiques with views across the lake and into the mountains. There’s also a dining experience for every occasion from casual to fine. Or you might try the Chateâu Gutsch? A renovated 19th century castle with 27 rooms decked out with four-poster beds, Swiss artworks and bold fabrics. Some of the rooms have private terraces with stunning views of the city and the lake. The Hotel is a small but strikingly modern hotel designed (by award-winning French architect, Jean Nouvel) to be a fashionable yet comfortable space. The facilities are excellent and the location is ideal. The room rate starts from around £145 per night. For flyers, the best option to get to Lucerne is to fly to Zurich (42 miles). Lucerne is connected up to the Swiss high-speed railway network and welcomes daily trains from Bern, Geneva and Zurich. June to September is the best time to enjoy Lucerne and the lake with temperatures generally sitting in the early 20s. Browse though our list of all the best places to stay in Lucerne. A historic property with charming, clasic décor in the heart of Lucerne. Individually styled rooms are dressed in keeping with the building's legacy, with hand-selected antique furniture and plush carpets. Traditional cuisine is served in equally traditional surrounds. A leading city hotel. An art deco hotel perched on a city centre hilltop, offering spectacular views of the mountains and the lake. Rooms are chic, comfortable and artistically decorated with a blend of contemporary and 1920's style and balconies. An award winning restaurant and a popular bar on site. 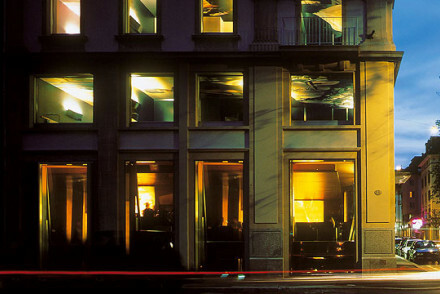 Foodies - The Scala Restaurant has been awarded 15 GaultMillau points, enjoy a fine gastronomic experience. Local exploring - Situated in the heart of Luzern, overlooking the lake and surrounded by restaurants and shops. Honeymoons - The penthouse spa suite is perfect for honeymooners offering lovely views of the Swiss Alps. Sights nearby - Visit the Chapel Bridge, Water Tower, the Spreuer Bridge and the Musegg Wall with its nine towers. A stylishly renovated 19th century castle, with chic modern décor. Rooms come with four-poster beds, bold fabrics, Swiss artworks, and private terraces offering stunning views of Lucerne and the lake. The restaurant serves Mediterranean cuisine and the bar has an extensive list of fine wines. Romantic Break - The vibrant rooms ooze a funky luxe feel with in room bathtubs, spectacular views from private terraces and fourposter beds. Active Holiday - Mount Rigi is great for hiking, walking and climbing, and is close to the Engelberg Ski Area. Local exploring - In a superb location, ideal for exploring the historic town of Lucerne. Sights nearby - The 14th century Chapel Bridge and the 19th century Lion Monument cannot be missed. A gloriously glamorous Lucerne institution overlooking the lake and with far reaching views of the mountains. Opulent rooms filled with antiques and emblazoned with gold and beige hues. A wide choice of dining experiences from casual to fine-dining. Ideal for a romantic weekend getaway. 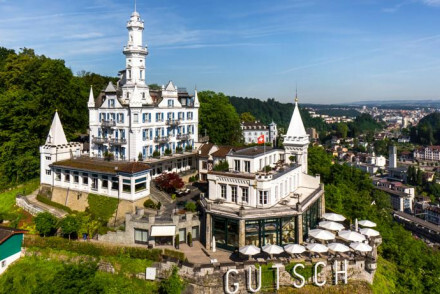 City Style - Bask in the lap of luxury in this grand French Renaissance inspired hotel, on the banks of Lake Lucerne. Sights nearby - Marvel at the Chapel Bridge and octahonal Water Tower, Switzerland's most photographed historical monument. Great walks - Wander along the banks of Lake Lucerne taking in the city sights and the impressive Alpine views. 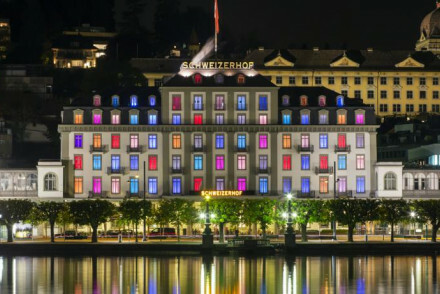 A stylish, five-star hotel overlooking Lake Lucerne. Each room is individually decorated drawing inspiration from specific artists, musicians and writers. There are two restaurants to choose from and guests can relax in the hotel's spa. A great hotel for business trips. Business meetings - With excellent conference facilities and a central location, it's the ideal spot for business meeting in Lucerne. Local exploring - Right in the heart of Old Town of Lucerne, next to the lake, it's perfectly positioned for exploring. Sights nearby - Just a short stroll from the old town and monuments such as Chapel Bridge, Musegg Wall and Lion Monument.